The single was re-released in the UK in 1985, but this time only reached number 93. However, in 1990, "It's My Life" was reissued again to promote the compilation album Natural History: The Very Best of Talk Talk. This time, the song was a hit in the UK, reaching number 13, the band's highest chart-placing single in its native country. The song is also featured on the Rockstar Games video game for PlayStation Portable and PlayStation 2 Grand Theft Auto: Vice City Stories on the 'Flash FM' radio station. It also is one of the songs played during gameplay for Activision Anthology for the PlayStation 2. The song is featured on Saints Row: The Third on 'The Mix 107.77' radio station. There are two versions of the video for "It's My Life". The first, envisioned by director Tim Pope as a statement against the banality of lip-synching, consists almost entirely of footage from wildlife documentaries, interspersed with shots of Talk Talk lead singer Mark Hollis standing in various places throughout the London Zoo. He keeps his hands in his coat pockets and his mouth pointedly shut tight, the latter often obscured by hand-drawn animated lines that occasionally appear in the documentary footage sequences as well. The second version, recorded at the behest of EMI, consisted of the entirety of the original video projected on a green screen behind Hollis on guitar and vocals as well as his two bandmates as they lip-synched and mimed the song, deliberately poorly and with comic exaggerated gestures. The American ska band No Doubt recorded a cover version of the song to promote their first greatest hits album The Singles 1992–2003 (2003). Because the band was on hiatus, while lead singer Gwen Stefani recorded her solo debut album, they decided to record a cover to avoid having to write a new song. Eventually, after the band listened to hundreds of songs from the 1980s, they narrowed it down to two contenders — "It's My Life" by Talk Talk and "Don't Change" by Australian rock band INXS ("A Question of Lust" by English electronic band Depeche Mode was another close contender). No Doubt were dubious about recording a cover and contemplated writing new material. However, they decided on "It's My Life" after rehearsing the song with producer Nellee Hooper, referring to it as a "feel-good" song. No Doubt's version of "It's My Life" was nominated for Best Pop Performance by a Duo or Group with Vocal at the 47th Grammy Awards. Jacques Lu Cont, the song's programmer, created the Thin White Duke mix of "It's My Life", which won the award for Best Remixed Recording, Non-Classical. This version was featured on the video game Karaoke Revolution Volume 2. On 9 December 2008 it was also made available as downloadable content for the Rock Band series. No Doubt's cover version was successful in the United States, reaching number ten on the Billboard Hot 100, and remaining on the chart for 28 weeks. On the Radio & Records CHR/Pop Airplay chart the song debuted at number 41 on the October 10, 2003 issue and after six weeks reached and peaked at number five staying there for two non-consecutive weeks, it remained on the top-ten of the chart for nine weeks and remained on it for 20 weeks. It was moderately successful on adult contemporary stations, reaching number 20 on the US Adult Contemporary chart, but had high longevity and appeared atop the Adult Top 40's recurrent chart. The single was more successful at nightclubs, peaking at number 16 on the US Dance Club Songs chart, and had some play on modern rock stations, reaching number 32 on the US Alternative Songs chart. The Recording Industry Association of America certified the digital download Gold for selling 500,000 copies. On the UK Singles chart, "It's My Life" debuted at number 20 but was unable to reach a higher position until it was released with a remix of the No Doubt song "Bathwater" which boosted the single up to number seventeen. The single dropped off the chart after seven weeks. It was more of a success across Europe, reaching the top-ten in Italy, Finland, Germany, Ireland, the Netherlands, Norway and Sweden, and the top 20 in Austria, Belgium, France and Switzerland. The single reached number seven on the ARIA Charts in Australia, lasting 17 weeks on the chart, and was listed at number 81 on the 2004 year-end chart. The Australian Recording Industry Association certified the single Platinum in 2004 for shipping 70,000 copies. No Doubt's lead singer Gwen Stefani on trial in the music video. The 1930s-style music video for the song was directed by David LaChapelle. In the video, Stefani portrays a black widow whose look closely resembles that of actress Jean Harlow (whom Stefani portrayed in the Martin Scorsese film The Aviator), who is put on trial and sentenced to death for the murders of three men she knew, who are portrayed by the other members of the band. She kills the first man (guitarist Tom Dumont) with rat poison mixed into his dinner, the second (bassist Tony Kanal) by running him over with his car, and the third (drummer Adrian Young) by throwing her hair dryer into the bathtub to electrocute him. These scenes are intercut with moments of Stefani in court and being dragged to the gas chamber wearing a prison uniform where she is executed. The video ends with the three murder victims together presumably in the afterlife, laughing at her televised execution. The music video was moderately successful on video chart programs. On MTV's Total Request Live, it reached number 7 in November 2003 and was on the countdown as late as January 2004. The video peaked at number 8 on MuchMusic's Countdown and remained on the program through March 2004. At the 2004 MTV Video Music Awards, "It's My Life" won the awards for Best Group Video and Best Pop Video. It also received nominations for Best Direction, Best Cinematography, and Best Art Direction. ^ Jonathan Barnes (18 October 2010). "When the man from Talk Talk fell silent". EADT 24. Eadt.co.uk. Retrieved 23 July 2013. "the EMI-signed group achieved reasonable commercial success; even a couple of top 20 singles in the synth-pop classic It’s My Life"
^ Amy Phillips (31 August 2012). "Talk Talk's Mark Hollis Resurfaces With New Music for the Kelsey Grammer TV Show "Boss"". Pitchfork. Pitchfork Media Inc. Retrieved 23 July 2013. "After hitting it big as new wave stars in the early and mid-80s, with massive singles like "It's My Life" and "Life's What You Make It", Talk Talk abandoned synth-pop and went experimental." ^ Alan McGee (9 April 2008). "Wherefore art thou Mark Hollis?". The Guardian music blog. Retrieved 25 January 2014. ^ bulion. "Forum - ARIA Charts: Special Occasion Charts - CHART POSITIONS PRE 1989". ARIA. Australian-charts.com. Archived from the original on 20 October 2013. Retrieved 23 July 2013. ^ "Top Singles - Volume 40, No. 11, May 19, 1984". Library and Archives Canada. Retrieved 23 July 2013. ^ "Lescharts.com – Talk Talk – It's My Life" (in French). Les classement single. Retrieved 23 July 2013. ^ "Offiziellecharts.de – Talk Talk – It's My Life". GfK Entertainment Charts. Retrieved 23 July 2013. ^ "I singoli più venduti del 1984". HitParadeItalia (in Italian). Creative Commons. Retrieved 23 July 2013. ^ "Nederlandse Top 40 – Talk Talk - It's My Life" (in Dutch). Dutch Top 40. Retrieved 23 July 2013. ^ "Dutchcharts.nl – Talk Talk – It's My Life" (in Dutch). Single Top 100. Retrieved 23 July 2013. ^ "Charts.nz – Talk Talk – It's My Life". Top 40 Singles. Retrieved 23 July 2013. ^ a b "Talk Talk". Official Charts Company. Retrieved 23 July 2013. ^ "Talk Talk awards at Allmusic". Allmusic. Rovi Corporation. Retrieved 23 July 2013. ^ "Mainstream Rock Songs, May 12, 1984". Billboard. Retrieved 26 March 2018. ^ "Ultratop.be – Talk Talk – It's My Life" (in Dutch). Ultratop 50. Retrieved 23 July 2013. ^ "It's My Life - TALK TALK". VRT (in Dutch). Top30-2.radio2.be. Archived from the original on 9 April 2012. Retrieved 23 July 2013. ^ "Charts-Surfer". Media Control Charts. Charts-surfer.de. Archived from the original on 8 January 2009. Retrieved 23 July 2013. ^ "The Irish Charts - All there is to know". IRMA. Archived from the original on 12 October 2011. Retrieved 23 July 2013. 2nd and 4th results when searching "It's my life"
^ "IT'S MY LIFE - Talk Talk". Nowe Media, Polskie Radio S.A. LP3.polskieradio.pl. Retrieved 23 July 2013. 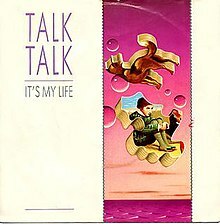 ^ "British single certifications – Talk Talk – It's My Life". British Phonographic Industry. Retrieved 18 March 2019. Select singles in the Format field. Select Silver in the Certification field. Type It's My Life in the "Search BPI Awards" field and then press Enter. ^ a b c Jennifer Vineyard and SuChin Pak (15 September 2003). "No Doubt To Tell Fans 'It's My Life'". MTV News. MTV.com. Retrieved 23 July 2013. ^ a b Paris Montoya and Tom Lanham "It's My Life". The Singles 1992-2003. Interscope Records. 25 November 2003. ^ "Grammy Awards 2005: Key winners". BBC News. News.bbc.co.uk. 14 February 2005. Retrieved 23 July 2013. ^ a b c "No Doubt - It's My Life - Music Charts". aCharts.us. Retrieved 23 July 2013. ^ a b c "No Doubt awards at Allmusic". Allmusic. Rovi Corporation. Retrieved 23 July 2013. ^ "RIAA - Gold & Platinum Searchable Database". RIAA. RIAA.com. Retrieved 23 July 2013. ^ "ARIA Charts - End Of Year Charts - Top 100 Singles 2004". ARIA Charts. Aria.com.au. Retrieved 23 July 2013. ^ "ARIA Charts - Accreditations - 2004 Singles". ARIA Charts. Aria.com.au. Retrieved 23 July 2013. ^ Jennifer Vineyard, Corey Moss (27 October 2003). "Gwen Stefani Bumps Off Bandmates In 'It's My Life'". MTV. Viacom International Inc. Retrieved 23 July 2013. ^ Jennifer Vineyard (27 October 2003). "Gwen Stefani Feeling Hella Good About Role In Scorsese Flick". MTV. Viacom International Inc. Retrieved 23 July 2013. ^ "ATRL - The TRL Archive - Recap: November 2003". ATRL. vBulletin Solutions, Inc. Retrieved 23 July 2013. ^ "ATRL - The TRL Archive - Recap: January 2004". ATRL. vBulletin Solutions, Inc. Retrieved 23 July 2013. ^ "MuchMusic Countdown". MuchMusic. BellMedia. Archived from the original on 13 January 2009. Retrieved 5 September 2004. ^ "MTV Awards 2004: The winners". BBC News. News.bbc.co.uk. 3 August 2004. Retrieved 23 July 2013. 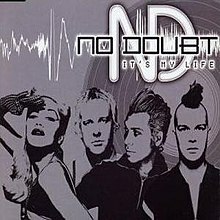 ^ "It's My Life: No Doubt: Amazon.co.uk: Music". Amazon.co.uk. Retrieved 17 July 2012. ^ "It's My Life/Bathwater: No Doubt: Amazon.co.uk: Music". Amazon.co.uk. Retrieved 17 July 2012. ^ "It's My Life/Bathwater at Juno Records". Juno. Archived from the original on 14 January 2013. Retrieved 17 February 2012. ^ "Australian-charts.com – No Doubt – It's My Life". ARIA Top 50 Singles. Retrieved 23 July 2013. ^ "Austriancharts.at – No Doubt – It's My Life" (in German). Ö3 Austria Top 40. Retrieved 23 July 2013. ^ "Ultratop.be – No Doubt – It's My Life" (in Dutch). Ultratop 50. Retrieved 23 July 2013. ^ "Ultratop.be – No Doubt – It's My Life" (in French). Ultratop 50. Retrieved 23 July 2013. ^ "Canada Top 20". Retrieved 13 March 2018. ^ "No Doubt: It's My Life" (in Finnish). Musiikkituottajat – IFPI Finland. Retrieved 30 August 2015. ^ "Lescharts.com – No Doubt – It's My Life" (in French). Les classement single. Retrieved 23 July 2013. ^ "Offiziellecharts.de – No Doubt – It's My Life". GfK Entertainment Charts. Retrieved 23 July 2013. ^ "Italiancharts.com – No Doubt – It's My Life". Top Digital Download. Retrieved 23 July 2013. ^ "Nederlandse Top 40 – No Doubt - It's My Life" (in Dutch). Dutch Top 40. Retrieved 23 July 2013. ^ "Dutchcharts.nl – No Doubt – It's My Life" (in Dutch). Single Top 100. Retrieved 23 July 2013. ^ "Charts.nz – No Doubt – It's My Life". Top 40 Singles. Retrieved 23 July 2013. ^ "Norwegiancharts.com – No Doubt – It's My Life". VG-lista. Retrieved 23 July 2013. ^ "Nielsen Music Control". Archived from the original on 22 October 2007. ^ "Official Scottish Singles Sales Chart Top 100". Official Charts Company. Retrieved 13 March 2018. ^ "Swedishcharts.com – No Doubt – It's My Life". Singles Top 100. Retrieved 23 July 2013. ^ "Swisscharts.com – No Doubt – It's My Life". Swiss Singles Chart. Retrieved 23 July 2013. ^ "Official Singles Chart Top 100". Official Charts Company. Retrieved 23 July 2013. ^ "No Doubt Chart History (Adult Contemporary)". Billboard. Retrieved April 23, 2017. ^ "No Doubt Chart History (Adult Pop Songs)". Billboard. Retrieved April 23, 2017. ^ "No Doubt Chart History (Alternative Songs)". Billboard. Retrieved April 25, 2017. ^ "No Doubt Chart History (Dance Club Songs)". Billboard. Retrieved April 23, 2017. ^ "No Doubt Chart History (Pop Songs)". Billboard. Retrieved April 23, 2017. ^ "ARIA Charts - Accreditations - 2003 Singles". ARIA Charts. Aria.com.au. Retrieved 23 July 2013. ^ "Gold & Platinum Searchable Database". RIAA. Retrieved 25 December 2013.